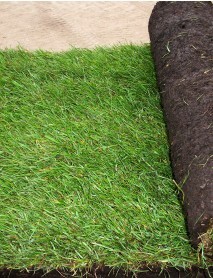 All our lawn turf is seed grown and is of a very high standard. 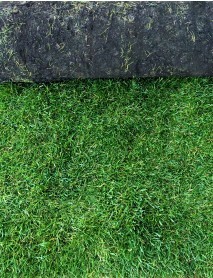 To keep things simple we supply 2 different grades of turf. 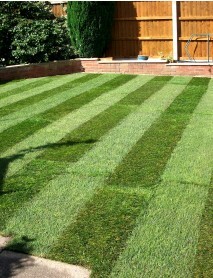 A lawn that looks green and lush and will withstand children playing on it - Our "Luxury hardwearing turf". Or alternatively, for those working to a budget looking for a good quality, general purpose garden turf - Our "Utility turf"
A thick lush green lawn turf in appearance, ideal for front or back lawns, high quality appearance, suitable for children to play on. 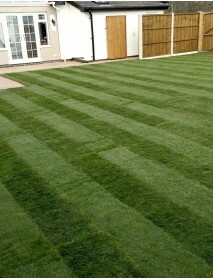 A good quality garden turf, suitable for those on a budget looking for a lawn that will stand up to children playing on it, a good general use lawn turf.